A nuclear reactor that produces energy by fusing light nuclei together, instead of splitting heavy nuclei apart as in the fission process. 1. A reference to having no practical effect or useful result: A futile effort is one which cannot succeed, is a waste of time, and gets a person nowhere. 2. Lacking serious value, substance, or a sense of responsibility: Efforts to convince some stubborn people that they should eat healthier food and lose weight is a futile attempt and will not succeed. 3. Trifling and frivolous; idle: Any futile attempt refers to any action that is ineffective, vain, useless, and incapable of producing a desired objective. Trying to start a car with a flooded carburetor by stepping hard on the gas pedal is a futile effort because it won't work. 4. Etymology: from Middle French (about 1400 to 1600) futile, from Latin futilis, "vain, worthless, futile"; literally, "pouring out [of a vessel] easily"; therefore, "easily emptied, leaky, unreliable"; from fundere, "to pour, to melt". © ALL rights are reserved. In a manner that is incapable of producing results; useless; not successful; not worth attempting. A person who is convinced that human desires and actions can not be successfully accomplished. 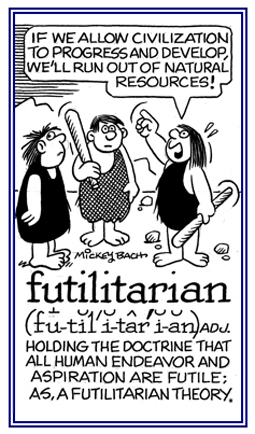 Referring to an opinion that human activities and desires are incapable of being achieved and so they are not worth attempting: So far one would think that it is a futilitarian idea that people all over the world can live together in peace. © ALL rights are reserved. The belief that human endeavors or efforts and aspirations are useless and can not be achieved. 1. Uselessness as a consequence of having no practical result. 2. Lack of importance or purpose; frivolousness or not serious or sensible. 1. The diffusion of a substance through water. 2. The diffusion of one liquid through another liquid. An indirect transfusion in which the donor is first immunized by means of injections of an antigen prepared from microorganisms isolated from the recipient; later, the donor's blood is collected, defibrinated, and then administered to the patient. The latter is then presumably passively immunized by means of an antibody formed in the donor; for example, an antibody that reacts with the microorganisms in the patient. A transfusion of blood from a donor to a suitable storage container and then to the patient. 1. Introduce into the body through a vein, for therapeutic purposes: A drip was used to infuse the medicine into Nathan's bloodstream so he wouldn't have any more pain after the car accident. 2. To fill or cause to be filled with emotion: Sandra was infused with joy after hearing that her grandparents were coming to visit. 3. To fill by pouring: Rebecca infused the tea pot with boiling water. 4. To instill or to inculcate, as principles or qualities: Ms. Richison tried to infuse her students to love the English language by telling them jokes! 5. Etymology: from Latin infudere, "to pour in"; so, to infuse anything means "to instill something as if by pouring". Anything which infuses something else permeates and saturates it. © ALL rights are reserved. 1. 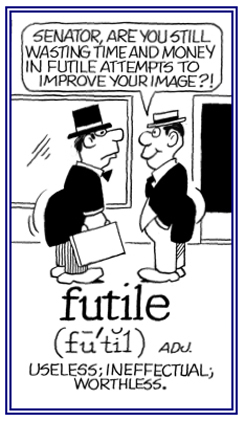 Incapable of fusion or melting (Latin in-, "not" + fusio, "fusion"). 2. Capable of being made into an infusion (Latin in, "into" + fundere, "to pour"). 1. Resisting melting together (Latin in-, "not" + fusio, "fusion"). 2. That which can be poured in (Latin in, "into" + fundere, "to pour"). 1. A reference to a liquid or mixture created by putting ingredients into it: In the afternoon, Mrs. Charmson enjoyed an infusion of herbal teas with her delicate sandwiches and cookies. 2. The addition of a new or necessary quality or element to something: The new reporter at the local paper brought a welcome infusion of new ideas and witty style to the publication that was usually so serious and boring. 3. Any liquid substance, other than blood, that is introduced into the body through a blood vessel for therapeutic purposes: The nurse in the Emergency Ward installed a needle that was inserted into a vein of William's arm and secured so it would not have to be removed, or fall out, in order to allow the infusion of necessary medications. 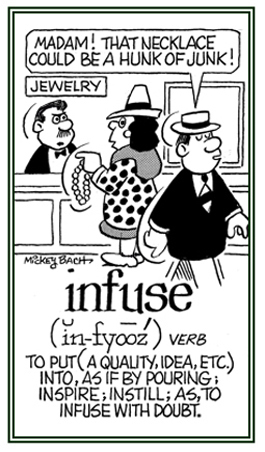 This cartoon helps people to have a better comprehension as to what this infusion entry means. Showing page 5 out of 8 pages of 111 main-word entries or main-word-entry groups.